Various difficulties, the chasm is difficult to strenuous, the remainder of the hike is moderate. Indeed one of the most unique natural spots in Southern New England, the centerpiece of this hike is the granite chasm which in spots is up to 70 feet deep. It features countless boulders and some caves. Climbing the walls of the chasm is prohibited except by permit. Many injuries have occurred here and there are several warning signs throughout the chasm. In fact, I would suggest checking the forecast before heading here. A damp or rainy day could make the scaling over the rocks and boulders outright dangerous. Also the chasm itself is generally closed in the winter months. Starting early and one of the first to arrive I started today’s hike by first tackling the chasm. The chasm entrance is well marked and the Chasm Loop Trail is blazed blue. It took a little time to conquer this first part of the hike for a couple of reasons. First, scaling and maneuvering over and around the quarter mile of boulders. Second, this is a great place for a guy with a camera (that would be me) to capture the sun coming over the chasm walls. 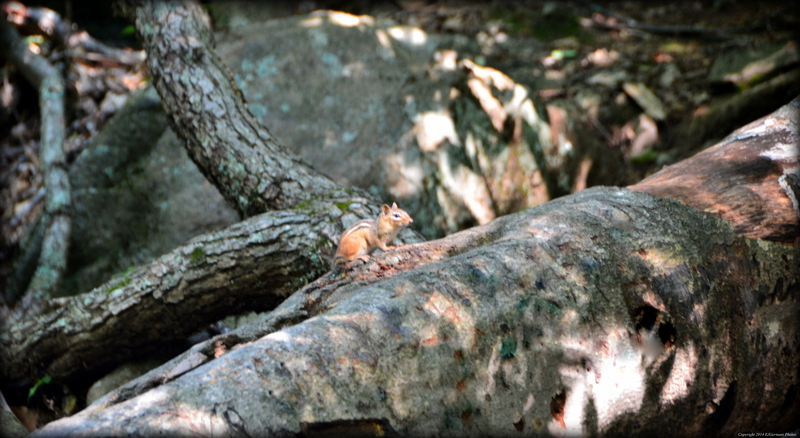 And lastly, I found myself spending some time watching the endless amounts of chipmunks in the chasm. Near the end of the chasm I turned left and continued to follow the blue blazed Chasm Loop Trail as it winded uphill. From this trail there are some impressive views of the chasm. Be sure to not get to close to the edges. I came across Fat Man’s Misery (which I choose to just view) and the Devils Corncrib before following the trail back to the chasm entrance. From here I went around the pavilion to the beginning of the trail named Charley’s Loop. It is a yellow blazed trail that winds through the southeast section of the reservation. I came across some early morning dog-walkers along this stretch. When I reached the intersection with the signage I followed the Little Purgatory Trail which was blazed green. When I reached the small chasm with the trickling waterfall I followed a trail to the right looking for the loop. After a bit I realized that there were no longer any blazes and the trail didn’t seem to loop back in the proper direction. So I retraced my steps back down the trail until I got to the “road”. Here I turned left then left again onto the orange blazed Forest Road Trail. This old stone and dirt road seemed endlessly uphill before it broke off right into the woods. At the end of the Forest Road Trail I turned left onto the Old Purgatory Trail, still blazed orange, as it wound up and down through the forest. The trail eventually end at Purgatory Road where I turned right and made my way back to the car. I did not expect to get 3.5 miles of hiking here (and I suspect it had to do with getting a little off track on the Little Purgatory), but I must say, this was a rather challenging hike on a warm summer morning. Well worth the challenge though. 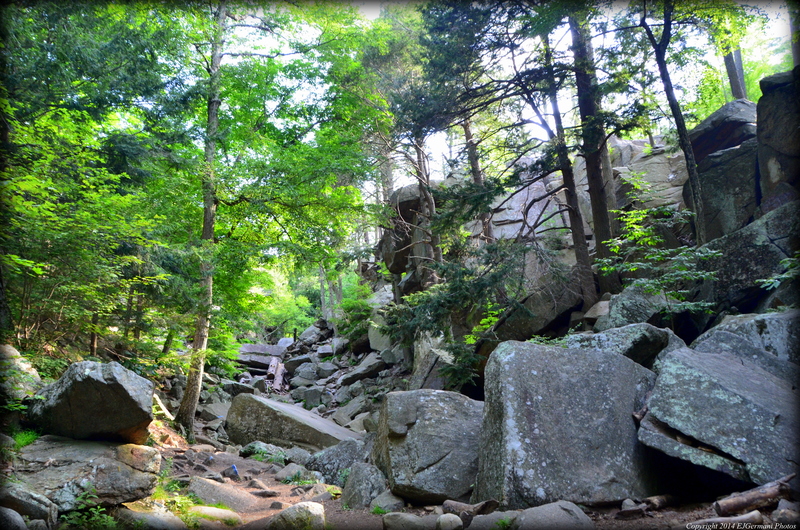 Trail Map can be found at: Purgatory Chasm.